Kim Bruun Dreyer is a native of Denmark who has loved horror pictures from an early age. He concluded his university education with a thesis on textual references and the role of the subjective camera in slasher films, and has contributed to the Danish genre webzine UNCUT.DK. You might say my parents were a bit overprotective. At the video rental store, I was always drawn to certain titles: A Nightmare on Elm Street, Friday the 13th, Maniac Cop… With their lurid cover art, they conjured up images of the grotesque in my pre-teen mind. They were so evocative, so frightening, and so forbidden. My father would pick out movies he found more appropriate for my age and sensibilities, and I was always slightly disappointed. Then came the summer of 1992. I was thirteen. My cousin was on vacation, and my mother and I were staying at her flat to look after her dog, Boss. Boss was a Rottweiler, a powerful animal whose bulk exceeded mine. While we were there, he drank sea water and defecated on my cousin’s designer furniture...which amused me more than it did my mother, as it fell upon her to clean it up. It was during that stay that I first became acquainted with Lucio Fulci. 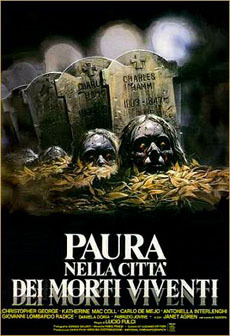 I had previously convinced my parents to let me watch C.H.U.D., and observing that I seemed no worse for wear, my mother rented City of the Living Dead (née Paura nella città dei morti viventi), which we watched with my cousin’s younger brother. So, what sticks with me some eighteen years later? Not necessarily the specifics of the plot. When Fulci enthusiasts hail The Beyond and City of the Living Dead as masterpieces of the genre, they often praise the nightmarish visuals while dismissing lapses in narrative logic with such generous terms as “surreal” or “otherworldly." And Fulci does create some visually spectacular setups. When Mary receives a vision of the priest’s death, we see his hanging body superimposed on her iris. Even more delirious is the scene where Mary is trapped in a coffin and Bell chops away at the lid to free her, with his pickaxe coming within millimeters of her face several times. Yes, Fulci can compose a shot with the best of them. However, he also stretches the dramatic license quite a bit in the service of such virtuosity. Bell’s rescue attempt is dangerously reckless at best: Another person is trapped inside a coffin and he decides that the best course of action is to hack madly at the lid with a pickaxe?! And why does Bell accompany Mary to Dunwich? Does he actually believe her outrageous story about a city of the walking dead, or is he planning to do an article about a phoney psychic? The question is never addressed in a satisfactory manner. After having saved Mary from being buried alive, he just tags along until a zombie shows up and squeezes out his brain like a big ol’ pimple. And on that note, Fulci really dishes out the gruesome stuff. The zombies are gooey, the actors get worms and maggots smeared on their faces, and in a rather realistic scene, a drill bit bores through a young man’s head. The scene that was etched most deeply in my memory was the undead priest’s sudden attack on the young couple making out in their car. He blinks into existence, his red-rimmed eyes fixing on the girl. She weeps blood, her jaw drops - and her guts pour out of her mouth. “Man, if I took a barf like that, I’d brush my teeth twice,” my cousin’s brother crassly remarked...momentarily breaking the spell of the movie. Fulci is no less successful with the subtly atmospheric shots. From banks of fog drifting down the night lit streets of Dunwich, to a patch of earth heaving slowly as a rotting figure emerges, this is a visually impressive film. A collage of striking gothic imagery, City of the Living Dead begs one to be forgiving when the necessity of a storyline is less tight. When the credits rolled past midnight, my mother and I were both spooked. But neither of us wanted a reprise of the furniture fiasco, so we braved the darkness of a nearby park with Boss. The air was silent, save for the dog’s panting as he dragged us down a lonesome path. Without warning, a figure materialized from the blackness. We jumped. He had appeared as suddenly as Fulci’s teleporting zombies, and for a brief moment, he was just as frightening. That's the power of City of the Living Dead.